A very traditional Greek favorite, stewed artichokes and fava beans / aginares me koukia / αγκινάρες και kουκιά is one of the few recipes on The Greek Vegan where I recommend using canned/frozen veggies. They’re a big time saver of course and, the way this dish is prepared, you really lose nothing in terms of overall flavor. It’s just the perfect quick, healthy and yummy dinner on a busy night. 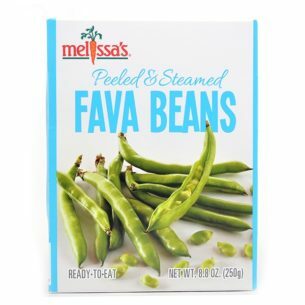 I love to use Melissa’s Produce organic, peeled and steamed fava beans when I can find them. They are sold sealed and refrigerated and last for a couple of months without an issue. If using Melissa’s, include the bit of liquid they are packed in in the recipe. If fava beans are difficult to find, substitute ford hook lima or butter beans instead. Canned (Goya is good canned choice) or frozen are both fine, only make sure they’re not flavored in any way. Thaw/drain and use as directed below. And for the artichokes, 365 Organics is my go-to canned, whole artichokes in water. They’re little guys, just the cutest things, and come about 5 or 6 to a can. For this recipe, I use 2 cans and always have a few on hand in the cupboard. My absolute favorite frozen brand is Barba Stathis, directly from Greece. 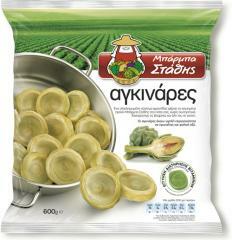 Kid you not, they just taste Greek! I get them from our local Greek product superstore Greek International Food Market and, as an aside, Barba Stathis also imports about every other vegetable (frozen) out there. Worth looking for, I promise! There are also a few good domestic frozen brands (Birdseye Deluxe) as well though they are almost always quartered artichokes. Perfectly fine, simply different look. Thaw/drain and use as directed below. Two herbs make this dish divine: dried marjoram which I think of as a sweeter version of oregano while still having an earthiness to it and fresh dill. The marjoram is cooked along with the rest of the ingredients and the fresh dill goes in right at the end preserving it’s beautiful, bright dilliness. It’s good to crush the dried marjoram in your fingers before adding to the pot and always remember to leave a bit of chopped, fresh dill to garnish with as well. Oh, and if you don’t have marjoram on hand you can sub in oregano in half measure – then, go out and get some marjoram! You have your choice of scallions (green or spring onions), leeks or plain white onions. My preference is scallions as they add a peppery bite to this otherwise delicate dish. And they’re pretty. I don’t recommend using red onions only because they tend to discolor in a recipe like this, turning a darkish grey color…… Leeks are wonderful here but make sure you like leeks before using them. They’re not for everyone but I love love them myself. Saute scallions and garlic in olive oil over low heat for 2-3 minutes. Careful not to burn! Add the fava beans and drained artichokes, salt, crushed marjoram and white wine. Cook over medium heat for 5 minutes. Add water and lemon juice, bring to low boil and cook uncovered for 10 minutes. Remove from heat and add dill. Gently stir to combine all and allow to sit for a few minutes before serving. Serve hot from the stove, garnished with fresh dill and a wedge of lemon alongside a good piece of bread. 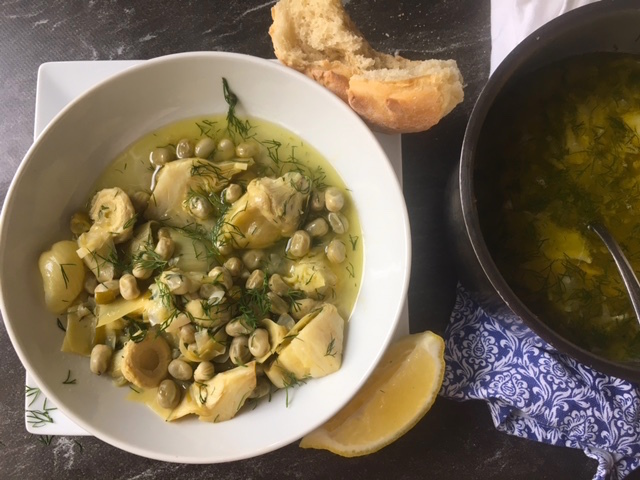 Stewed artichokes with fava beans are also lovely served at room temperature and are a great take for lunch option next day. This recipe serves 2 adults well and is infinitely scalable to suit your family’s needs. Absolutely my favorite go-to meal on a busy night! Oooh now this looks comforting. With that sparkle of wine and lemon juice I can just imagine it would taste as wonderful the next day straight from the fridge. Thanks for the tip on buying frozen artichokes. I wouldn’t have thought of it. 1/3 fresh dill… 1/3 what measurement? I’m making this now! Sounds awesome, smells awesome! cup 🙂 and thanks for finding that, just fixed it above! Recipe was delicious! Made a double batch for leftovers… we didn’t have any leftover! What kind of white wine do you use with this? Another delicious recipe. 🙂 I love it. Making this now! Such a fluke that i found the same brand of frozen artichoke hearts at basfoods in melbourne (a bit expensive though.. $7 a packet?) Had to add potatoes to the recipe so it would go a bit further to feed 7 of us but i think they will taste even better when they absorb all that deliciousness! Can you use canned artichokes or will it become soggy? Thanks! What if I wanted to use fresh artichokes? Can you pls advise how I would prepare them for this soup? Thx! Wow – this is amazing. I followed your recipe precisely. Thank you so much for sharing. I’m a great cook, but I would have never created this on my own. I planned my entire day around this dish and it was so worth it.